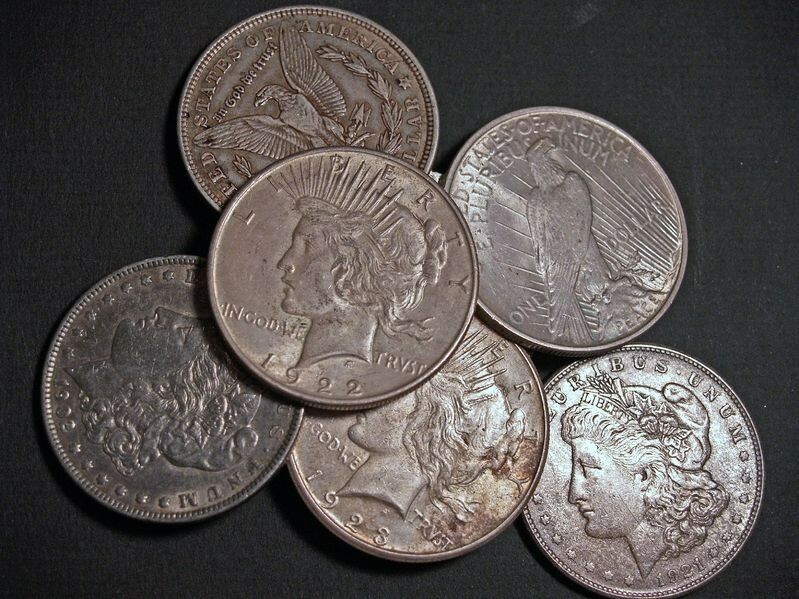 Silver dollars are among the most popular coins that collectors buy. These large silver coins are valuable both for their numismatic significance and their silver content. While the last circulating 90 percent United States silver dollar coins were struck in 1935, several million 40 percent silver dollars were made at the San Francisco Mint from 1971 through 1976. Since 1983, the United States Mint has struck an array of commemorative 90 percent silver dollars and in 1986 introduced the 0.999-fine American Silver Eagle bullion one-dollar coins, though none of these legal-tender pieces are intended for circulation. Early Silver Dollars – Made from 1794 through 1803, the early silver dollar coins are highly scarce and quite expensive. Flowing Hair silver dollars, made in 1794 and 1795, represent the first design type of the silver dollar coin and cost about $2,200 and up for a specimen grading Good-4. Common examples of the Draped Bust silver dollar type, most widely recognized by the rare, multi-million-dollar 1804 Draped Bust dollar (a special presentation piece that was actually produced in 1834), cost $1,000 and up for a Good-4 specimen. The Flowing Hair and Draped Bust silver dollars were both designed by Robert Scot. Liberty Seated Dollars – Christian Gobrecht’s classic Seated Liberty design, seen on most U.S. silver denominations in the 19th century, graced the dollar coin from 1840 through 1873. These coins are very scarce in original condition and are priced at about $300 and up for a “common” Good-4 specimen. Trade Silver Dollars – These silver dollar coins, not intended for circulation in the U.S., were designed by William Barber and struck from 1873 through 1885. They were primarily produced for trade with Asia. The most common Trade dollars sell for around $150 and up in a grade of Very Good-8, and many pieces are covered by “chop marks,” or insignias that were counterstamped onto the coins by various Eastern merchants. Morgan Silver Dollars – By far the most popular silver dollar type, Morgan silver dollars (officially known as the “Liberty Head silver dollar”) were designed by George T. Morgan and were produced from 1878 through 1904, and again in 1921. Morgan dollars are commonly sold to non-collectors and junk silver investors, though their most enthusiastic market is found among hobbyists who collect one of each date and mintmark variety. While common Morgan dollars can be bought for a small premium over their current silver spot value, some Morgan silver dollars, such as the rare Carson City Mint specimens, sell for hundreds and even thousands of dollars each. Peace Silver Dollars – In 1921, Anthony de Francisci designed the Peace dollar, which shows a head of Miss Liberty similar to that on the Statue of Liberty in New York. Like Morgan dollars, Peace silver dollars have a wide collecting base, though the run of this series was much shorter. Made only until 1935, the Peace dollar is a relatively common type, with some pieces selling for a small amount over their silver spot value. Scarcer Peace dollars, such as the 1921 and 1928 silver dollars, are worth hundreds. Eisenhower Silver Dollars – Regular-issue Eisenhower dollars struck for circulation are actually made from a copper-nickel composition, though the United States Mint did make a limited number of 40 percent silver dollars in both uncirculated and proof varieties at the San Francisco Mint. These 40 percent silver Eisenhower dollars were made from 1971 through 1976, and some sell for less than $10. The Eisenhower dollar series ended in 1978 and was followed by the Susan B. Anthony dollar coins in 1979. All Susan B. Anthony dollars are made from a copper-nickel clad composition. Collecting silver dollars can be a lot of fun and doesn’t have to be an expensive venture. One of the most affordable ways to sample everything that U.S. silver dollars have to offer is to build a silver dollar type set, which would include one example of each coin mentioned above. Such a coin collecting goal would cost at least $1,700 to $2,000 and makes a beautiful assemblage of some of America’s finest and most important coins.